Sims-Williams, Nicholas (ed.). 2017. An ascetic miscellany: The Christian Sogdian manuscript E28. Turnhout: Brepols Publishers. The Christian Sogdian manuscripts in Syriac script which were found at a Central Asian outpost of the “Church of the East”, the monastery at Bulayïq in the Turfan oasis, and are now preserved in the Berlin Turfan collection, include a large number of fragments in a distinctive handwriting which have been catalogued under the designation “E28”. Through his choice of texts to translate or to copy the scribe demonstrates his interest in the practice and traditions of monasticism, originating with St Anthony and the other “Desert Fathers”, the solitaries and monks of the Egyptian desert, and transplanted to Mesopotamia and Iran, according to legend, by Mār Awgen (Eugenius). In addition to works whose Syriac sources have been identified, such as passages from the spiritual writings of Šemʿon d-Ṭaibuteh, Isaac of Nineveh and Dādišoʿ Qaṭrāyā, as well as from the life of Mār Awgen, “E28” contains a number of unidentified texts, also no doubt translated from Syriac, many of which deal with aspects of the ascetic life. This volume contains an edition and translation of all the texts, most of them previously unpublished, together with a commentary, glossary and 35 plates. An appendix contains critical editions of some of the parallel Syriac passages. Sims-Williams, Nicholas. 2019. From liturgy to pharmacology. Christian Sogdian texts from the Turfan Collection. Turnhout: Brepols Publishers. Containing a variety of texts ranging from liturgy to pharmacology via hagiography, calendars and ascetical works by Isaac of Nineveh, this volume completes the publication of all known Christian Sogdian texts. This volume completes the publication of the Christian Sogdian texts of the Berlin Turfan Collection begun by F. W. K. Müller in 1907. Several Syriac texts are also included, in particular a series of liturgical texts in Syriac with Sogdian rubrics (edited in collaboration with J. F. Coakley). The texts edited here are mostly short but extremely varied and interesting. 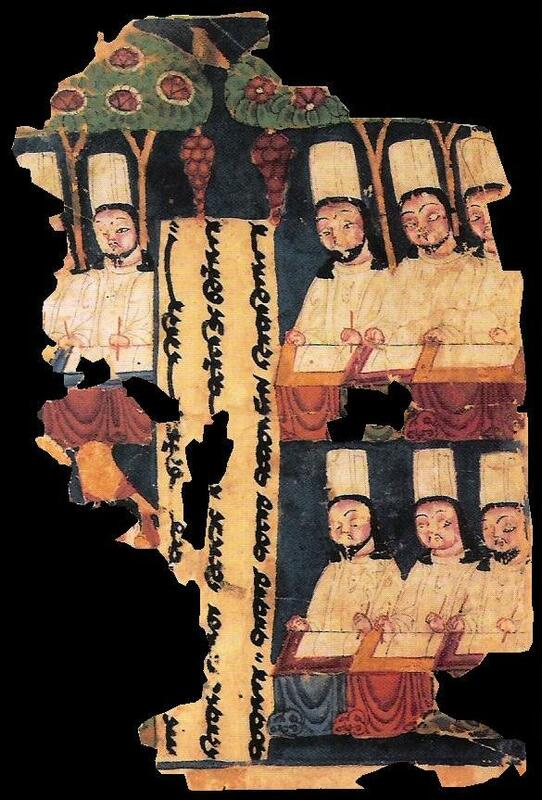 The Syriac liturgical fragments are some of the earliest surviving witnesses to the liturgy of the “Church of the East”, though the Sogdian rubrics which accompany them show that those who performed them were not native speakers of Syriac. Other texts connected with the liturgy include a Sogdian version of the Gloria in excelsis and a text explaining how to calculate the date of Easter or Lent. Hagiographical texts include fragments of the martyrdoms of St George and of Cyriacus and Julitta as well as part of the so-called “Six Books” on the Dormition of the Virgin Mary. Two pharmacological fragments (edited in collaboration with Dieter Maue) show familiarity with Indian medicine, while a “prayer-amulet” belongs rather to a Syriac tradition. Finally, a chapter contributed by Adrian Pirtea contains the re-edition of a well-preserved folio identified by him as a Sogdian version of a work by Isaac of Nineveh. On Saturday 25 March, as part of an ongoing research project, we are holding a one day Symposium on Manichaean Studies sponsored jointly by the Ancient India and Iran Trust, the International Association of Manichaean Studies and the Corpus Fontium Manichaeorum Project. Goff, Matthew, Loren Stuckenbruck & Enrico Morano (eds.). 2016. Ancient tales of giants from Qumran and Turfan: Contexts, traditions, and influences (Wissenschaftliche Untersuchungen zum Neuen Testament 360). Mohr Siebeck. While there has been much scholarly attention devoted to the Enochic Book of the Watchers , much less has been paid to the Book of Giants from Qumran. This volume is the proceedings of a conference that convened in Munich, Germany, in June 2014, which was devoted to the giants of Enochic tradition and in particular the Qumran Book of Giants . It engages the topic of the giants in relation to various ancient contexts, including the Hebrew Bible, the Dead Sea Scrolls, and ancient Mesopotamia. The authors of this volume give particular attention to Manichaeism, especially the Manichaean Book of Giants , fragments of which were found in Turfan (western China). They contribute to our understanding of the range of stories Jews told in antiquity about the sons of the watchers who descended to earth and their vibrant Nachleben in Manichaeism. Duration: two weeks, daily four seminars each 90 min. The Turfanforschung (Turfan Studies) at the Berlin Brandenburg Academy of Sciences and Humanities offers in 2016 a summer school providing an introduction to the field of Turfan Studies, which deals with the many languages and scripts used along the Silk Road as well as the histories and cultures of those who used them. The summer school will center around the two main languages of Turfan research. Sogdian, a middle Iranian language, was widely used as a lingua franca in Central Asia since the 1st c. A.C. Old Turkic was the language of Turkic nomads which had a strong influence on the Silk Road since the middle of the 6th c. After the migration of the Uyghurs it was also used as the main language in the Turfan area under Uyghur rule until 14th c.
The courses in this summer school will be given by the staff of the Turfanforschung and the Katalogisierung der Orientalischen Handschriften in Deutschland (Arbeitsstelle Berlin): A. Benkato, D. Durkin-Meisterernst, Y. Kasai, S.- Ch. Raschmann, C. Reck, A. Yakup. There will also be guest lectures by I. Colditz, M. Peyrot and L. Sander. Because a minimum number of participants are required for the summer school to take place, we ask for a binding registration by 20th May 2016 at rabuske@bbaw.de or in writing at: Berlin-Brandenburgische Akademie der Wissenschaften AV Turfanforschung, Jägerstraße 22-23, D-10117, Berlin. J. P. Laut, K. Röhrborn (eds.). 2014. Vom Aramäischen zum Alttürkischen: Fragen zur Übersetzung von manichäischen Texten (Abhandlungen der Akademie der Wissenschaften Zu Gottingen. Neue Folge, Band 29). De Gruyter. Manichaeism claimed to be a world religion. Thus, the problem of translating the Holy Scriptures was of paramount importance. The twelve studies in this volume examine the linguistic and cultural diversity and unique features of the translated texts of Eastern Manichaeism. This book will be of great interest to scholars of religious studies and to researchers in the fields of cultural history and language contact. For more information, see the ToC of this volume. Map drawn for a review published in Journal Asiatique, 291 1-2, 2003, p. 295-300 of Bregel, Yuri, An Historical Atlas of Central Asia, (Handbuch der Orientalistik, VIII : Central Asia, 9), Leiden : Brill, 2003, 109 p. Please feel free to modify and adapt it to your needs: the layers can be modified in Illustrator. Although I have drawn it I claim no copyright, but would welcome that you mention the source. Actually, the best map of this region and this period has been published in J. Hamilton, Manuscrits Ouïghours du IXe-Xe de Touen-Houang, Louvain, 1986. Dickens, Mark. 2013. Scribal practices in the Turfan Christian community. Journal of the Canadian Society for Syriac Studies 13. 3–28. A PDF of this article is available here. In this informal talk the Chair of the Ancient India and Iran Trust, Nicholas Sims-Williams, will describe his research on the Sogdian language and literature, in particular on the Christian texts from the Turfan oasis in Western China, and will try to answer a question which he is often asked: What led you to study such an obscure subject?